Groceries are one of those household expenses which can be extremely variable, depending on your family size, lifestyle, shopping habits and even which store you shop at. Prices continue to rise over the years, and groceries are often the largest variable household expense. That is why so many people are wondering how to save money on groceries. By making small changes, you can see a significant reduction in your grocery bill, and if you are really committed you could probably cut your bill in half. 1. Always make a shopping list before going to the grocery store. Do an inventory of your fridge, freezer and pantry for what you have and what you don’t have, then think about what meals you will be preparing that week (which ideally will coincide with what is on sale in the store flyer). This is where having a meal plan can really help your bottom line, but if you don’t like to meal plan then at least have an idea of meal ingredients you will use for the week. Without a grocery list you will forget items you actually need (leading to extra trips to the store) and buy food you already have, which if perishable may lead to wasted food and wasted money. Grocery stores are very clever about marketing their wares inside the store, and without a list you are more susceptible to be parted from your cash on things you don’t need. A grocery list is your plan of attack to get you in and out on budget and on target. Check the weekly flyers for sale items while making your list. 2. Reduce High-Priced items on your list. Avoid junk food and highly processed snacks. These items cost a premium while providing little to no nutritional value as well as costing you in terms of your health. Watch your beverages. Instead of buying fruit juices, buy fruit and drink fruit-infused water. Instead of buying pop/soda, drink home-filtered water. Cut back on meat by having regular meatless meals and smaller portions of meat. Also, buy cheaper cuts of meat such as bone-in, these will require some extra prep or tenderizing but will save you a fair amount of money. 3. Don’t go grocery shopping while hungry. When you shop while hungry, your stomach will convince you to buy more! You may buy yourself a snack to eat, which is not going to help you save money, but more importantly you will load up your cart with more food than you really need. 4. Shop at the optimal time. Try to go to the store when it is less busy and when you are in less of a hurry, that way you are able to take your time comparing prices and focus on the business of saving money. Also, find out when your store marks down meat, day-old bread and produce and go shopping then to get the best selection of the deals. Some stores will mark down items the night before or the morning of receiving a new weekly shipment of that item. 5. Do not go to the store more than once per week. Fewer trips to the store equals less money spent, period. Buy enough perishables to get you through 1 whole week, they should not go bad before you use them. If you run out of something, go without until your next shopping day and plan accordingly for next time. Don’t forget about the cost of gas or transit that comes with multiple trips to the store each week. 6. Are you shopping at a thrifty grocery store? Compare your store’s regular prices and sale prices to other stores, be sure that they are competitive (matching or lower priced) on the majority of their products. Some high-end shopping stores say they match prices, and have very good sales on specific items each week, but their regular prices are at a premium you will be paying more than you should. You do not want to have to price match to flyers for most of your grocery cart or be restricted to only sale items, it just isn’t realistic. Most grocery stores also offer generic store brand versions of the national brand products. They have simple packaging and less advertising so most of the time these cost less than name brand, so it’s worth trying these products to see if you like them just as much as the brand you know. Sometimes the quality and taste are on par, or even preferable, and sometimes not, so experiment to see where you can substitute generic brand products to save even more. 7. Buy on sale, buy in bulk. If you are organized with your pantry and freezer, then you may be able to build yourself a small “stockpile” as it is called. This allows you to stock up on items when they are at their lowest price, use them for the next 6-8 weeks (a typical length of sale cycle) and then re-stock at the lowest price again when they are back on sale, thereby never paying full price for your groceries. Knowing what is the lowest price of the items you buy most often is key – create a “price list” to keep track. Then watch the weekly flyers and you will know when to stock up on something and when to wait. 8. Don’t forget the coupons. Although your biggest grocery savings will be buying in bulk and sale prices, if you can combine that with coupons you will save even more. Search for coupons online before shopping, especially for larger priced items which may have larger valued coupons. You can easily find coupons for cleaning products, pharmacy items (over-the-counter drugs and vitamins), batteries, pantry products, bakery items and more. It can be difficult to find coupons for meat, dairy and produce but they do come out occasionally. Educate yourself on the right kind of foods to buy in bulk, and how to preserve different kinds of foods. Plenty of perishables can easily be frozen for months, while some can’t. You can freeze fruits, berries, nuts, bread and other bakery items, milk, shredded cheese, deli meat, yogurt, and many others. Make sure you wrap them and label them properly to prevent freezer burn and use them within the recommended time. Unless your dinner tasted nasty, you should never waste money by throwing the leftovers away. Leftovers can be re-purposed into a different dinner the next night, with a few things added in. One thing I like to do is to cook extra dinner and use the leftovers for lunch the next day. It not only saves the time of making a different lunch, it also saves money on buying different groceries for lunch and I can buy my dinner items in bulk for the most part. Plus, if you are like me and struggle with putting together lunches for work or school, eating leftovers saves you tons of money over eating out for lunch. Take advantage of your store’s loyalty rewards program, and/or credit cards with grocery rewards. The best rewards programs will allow you to use your points towards free groceries, rather than having to choose from a catalogue of items or gift certificates for things you may not need, but do some research and pick what has the best benefit for you. 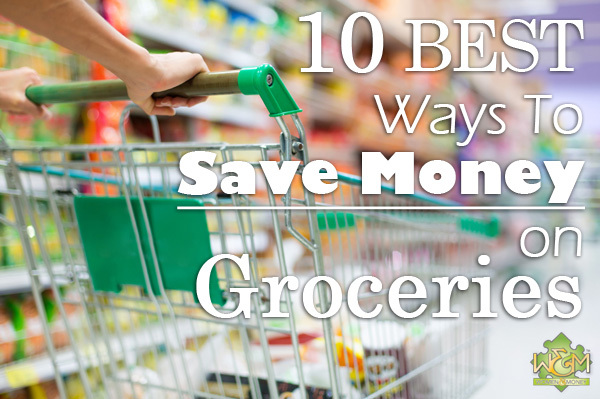 Follow as many of these tips as you can and be prepared to save big on your next grocery shop! You might also want to download our free monthly budget excel or pdf document to get your budget on track.